In today's post, we will look at a class of weapon called snubnose revolvers, also sometimes called "belly guns" or "snubbies". A snubnose revolver is a handgun that is designed for self-defense at short distances. In general, the term is used to refer to any revolver with a barrel that is 3 inches long or shorter. They were designed to fulfill the requirement of a small repeating handgun that could be concealed easily and drawn out quickly. The term "belly gun" might have come about because many people carried these weapons concealed in the trouser waist band, close to the belly. Other think that they're called belly guns because of the method of use: placing the barrel into the belly of the opponent and pulling the trigger. One of the early revolvers of the snubnose type was the Colt Shopkeeper Special model, which was based off the Colt M1877 Lightning model. This was a double action revolver designed for .38 Long Colt cartridge and the Shopkeeper Special model had a smaller barrel and no ejector rod, to keep the size compact. 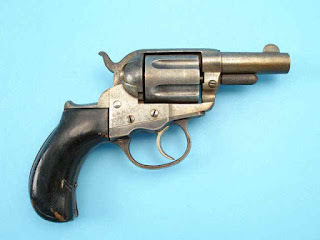 A Colt Shopkeeper Special revolver. Click on the image to enlarge. Public domain image. In those days, Colt revolvers were side-loaders. In 1894, Smith & Wesson invented a revolver where the cylinder is mounted on a crane which can swing outward for unloading or loading the revolver, with an attached push rod and star ejector to easily extract the cases. This design, along with the double action mechanism is what we see today in many modern revolvers. In 1927, Colt introduced their Colt Detective Special revolver model. It was based on their Colt Police Positive Special model, which was a six-shot revolver designed to fire the .38 Special cartridge. 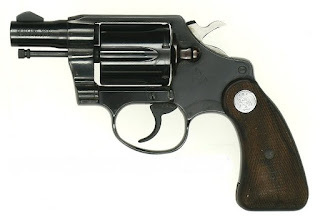 The Colt Detective Special used the same frame and six-round cylinder as the Positive Special model, but had a small 2 inch barrel (or in some models, the barrel was 3 inches long). A Colt Detective Special, courtesy of http://www.adamsguns.com/. Click on the image to enlarge. The new weapon immediately found popularity among police detectives who were tasked with missions that required them to dress like civilians. Soon after this, Colt discovered that there were a number of people that wanted a small concealed weapon. Therefore, they started making other models as well. For instance, the Colt Banker's model was based on the earlier Colt Police Positive revolver. The Colt Police Positive was designed for smaller cartridges (.32 Colt and .38 S&W) than the Colt Police Positive Special (which took .38 Special) and the Colt Banker's model was designed for the smaller cartridge, with the reasoning that weaker bankers wouldn't be able to handle the recoil of a .38 special cartridge. The nice thing about such small revolvers is that they are easy to carry around in a pocket or a purse and have repeating capability. Another reason that many people preferred these to the larger models was because of the speed that these could be pulled out. Anyone who has used a full sized revolver from a holster knows that the gun is relatively heavy and the long barrel has to be pulled clear of the holster before shooting. The snubnose equivalent is much easier to pull out from the same holster. After cheap semi-automatic pistols started becoming widely available in the early 1980s, the popularity of these revolvers declined in the US, mainly because pistols hold much more ammunition that revolvers do. Then, in 1994, the Federal Assault Weapons Ban passed for 10 years, which limited the availability of pistol magazines holding more than 10 rounds and suddenly, the popularity of these snubnose revolvers increased again, until the ban expired in 2004. Ability to conceal: These revolvers can easily be stored in a pocket or a purse. The curved grip is much easier to conceal than the straight grip of a semi-auto pistol and it doesn't look like a gun when placed inside a pocket. Easy to pull out: Due to its smaller weight and size, it is easier to pull one of these out of a holster than the equivalent full sized revolver model. Simplicity of use: It is much easier to teach someone to use a revolver than to use a semi-automatic pistol. Limp wristing is not a problem with revolvers, so even someone with a weak grip can use one. Revolvers are also less likely to malfunction than semi-automatics. If a revolver doesn't fire due to a bad cartridge, the procedure to clear it is to simply pull the trigger again. Heavy Double Action trigger: We saw a few posts ago that double-action triggers are harder to pull when placed in double-action mode. Therefore, it is not likely to go off, if it gets snagged in clothing, which provides extra safety. Better at close quarters: Not only is it faster to pull a snubnose revolver out, the shorter barrel means that an attacker can't grab on to it and try to wrestle it away. Also, unlike a semi-automatic pistol, a revolver can't be easily knocked out of battery. Can fire different types of ammunition. Capacity: Most modern snubnose revolvers have a 5-round capacity, whereas even a pocket sized semi-automatic pistol carries 6+1 rounds. Of course, there are those that argue that 5 rounds is more than enough in most cases. Higher recoil: Because of the smaller size and weight, the felt recoil force is much more on a snubnose revolver. Sights: Due to shorter barrels, the distance between the front and rear sights is smaller and therefore the sight radius is short. The longer the sight radius, the more accurately a weapon can be aimed. More time taken to reload a revolver. Due to their shorter barrel lengths, snubnose revolvers are perceived to have less accuracy than weapons with longer barrels. This is not entirely true, as they can be used pretty effectively to about 20 meters (22 yards) by most people and some people can even hit torso-sized targets up to 50 meters (55 yards) away. These days, Colt no longer manufactures snubnose models (such as Detective, Cobra or Python), but Smith & Wesson still makes snubnose models (e.g. Bodyguard, Model 19 etc. ), as does Ruger (SP101 and LCR). "more ammunition that revolvers do"
Also, "there are those that argue that 5 rounds is more than enough in most cases.". It's not about arguing, it's about facts. The fact is, 5 rounds is more than enough in most cases. Various statistics say there are, on average, 2-3 shots in a SD scenario. Of course, everyone would rather want to have more rounds just in case.